Bishop Columba Macbeth-Green was Â born in 1968 in Forbes NSW, the son of Paul Green and Lorna nee Macbeth. Raised on a farm, he was educated at St Laurence’s Primary School and Red Bend Catholic College in Forbes. Upon leaving school, he taught music and joined the Australian Army Reserve as a Piper. 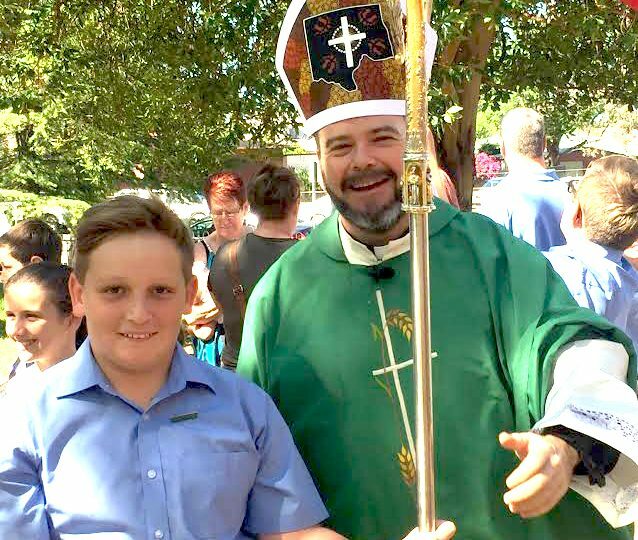 After spending two years with Conventual Franciscans, he joined the Order of St. Paul the First Hermit (Pauline Fathers) in 1990Â and studied for the Priesthood at Vianney College in Wagga Wagga. He made his Solemn Profession in the Order in 1996Â and was ordained a priest the following year on 22nd November 1997. The Pauline Fathers, founded in 1215 in Hungary, are a semi-contemplative order who observe the Rule of St. Augustine. They are based in Poland and are custodians of the Shrine of Our Lady of Czestochowa. As a Pauline Father, Fr. Macbeth-Green served as Administrator of Tarcutta Parish from 1998 to 2002, as Sub-Prior of the Shrine of Our Lady of Mercy at Penrose Park from 2002 to 2004, and as Administrator of Moss Vale Parish from 2004 to 2006. From 2000 to Â 2006, he served as a New South Wales Police Chaplain to the Wagga Wagga and Camden Local Area Commands. From 2006 to 2011, he served as Police Chaplain at Police Headquarters in Brisbane, and from 2011 to 2014, as full-time Police Chaplain for the Southeastern Region of Queensland. The Bishop’s appointment by Pope Francis was announced on 12 April 2014.